<*xml:namespace prefix = st1 ns = "urn:schemas-microsoft-com:office:smarttags" />MADRID. SPAIN. We are pleased to inform you that your EMAIL ADDRESSE has been selected as one of the 2 lucky winners in the email lottery programme conducted by the LOTERIA PRIMITIVA on the 29th of December, 2005. The release of this result was due to difficulties encountered in sorting out mixed up numbers and email addresses. All 2 winning addresses were randomly selected from a batch of 700,000,000 international and individual/companies E-mail addresses. Your email address emerged alongside with 2 others as a category "6" winner in this year's loteria primitiva award Draw. HOW WAS THE SELECTION DONE? Most recently the foundation set up the NEW HOPE LOTTERY to give out prizes based on the computer balloting system (THEREFORE YOU DO NOT NEED TO BUY A TICKET TO ENTER FOR IT.YOUR EMAIL ADDRESS WAS RANDOMLY SELECTED AS A WINNER). As a category "6 " winner, your lucky email addressee was selected by the email computer balloting device, where only email addresses are soughed, from a total number of 700,000,000 international and individual/companies E-mail addresses drawn from all over the globe, only two winners emerged in this category. 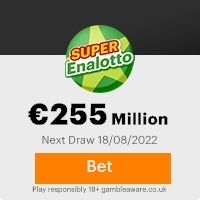 You winning email addressee has therefore been approved a lump sum payout of 1, 486, 653.09 Euro (One million, four hundred and eighty-six thousand, six hundred and fifty-three euro, nine cent only) in cash credited to file REF.HM/05/41824530/ES. This from a total cash prize â 2,973,306.18 (Two million, nine hundred and seventy-three thousand, three hundred and six euro, eighteen cent) shared among the 2 international winners in category "6. Below are the particulars attached to your LUCKY WINNING EMAIL? (i) The file Ref number: HM/05/41824530/ES. (ii) Result winning numbers: 4-10-20-23-46-48-30-7. (iii) Email ticket number: SM/2470/28/26. (iiii) Lotto code number: ZAD82649PK. To immediately claim your prize, contact the claim/paying agent on the telephone number below. The above claim agent will assist you in the processing and remittance of your winning prize (funds) to you. Also note that you are to contact and process your winning prize not later than one week, after this date if you do not contact and process your winning prize, all funds will be returned to the MINISTERIO DE ECONOMIA Y HACIENDA as unclaimed. 1. Please quote your Reference number, your full name and address, Country, Telephone, mobile, fax number and occupation to your claim agent. 2. Your winning prize is not DEDUCTABLE until it has been fully processed, approved and transferred to your designated account of your choice, by your claim agent above. VETT/APPROVAL DOCUMENT CHARGES (FEES) of your lucky WINNING EMAIL ADDRESSE to your real NAMES. For proper verification on your lucky winning email prize, you are to visit our online website page ( http://loteria.com/primitiva.php ) and indicate the date this email lottery programme draw of the LOTERIA PRIMITIVA was held [29th(dia) -12(mes)- 2005(Ano) Premio] and there you will find your result winning number( 4-10-20-23-46-48-30-7 ). Please verify your informationâs on the website page before contacting your claims agent. Once again on behalf of all our staff, CONGRATULATIONS!!! . This promotion programme is sponsored by LOTERIA PRIMITIVA TO ENCOURAGE THE USE OF INTERNET. All informationâs have to be kept out of public until your winning prize of (1, 486, 653.09 Euro) has been processed fully remitted to you by our accredited pay-point bank; this is to avoid double claim and unwarranted abuse of the programme by some participants. Copyright Â 1994-2006 The Loteria Primieiva S.l. All rights reserved. Terms of Service - Guideline. REPLY TO: primitivaclaimz@mixmail.com OR primitivaclaim@k.ro AND CALL MR. MARK LOPEZ ON 0034-696-755-219. FOR MORE INFORMATIONS ON HOW YOUR WINNING EMAIL ADDRESSE CAN OBTAIN THE VETTING APPROVAL DOCUMENTS ON YOUR NAME. This Email with the Subject "TICKET NO: SM/2470/28/26." was received in one of Scamdex's honeypot email accounts on Wed, 22 Nov 2006 14:40:07 -0800 and has been classified as a Generic Scam Email. The sender shows as Yoli Helena <yoli@yolihelena00.orangehome.co.uk>, although that address was probably spoofed. We recommend that you do not attempt to contact any persons or organizations referenced in this email, as you may expose yourself to scammers and, at the very least, you will be added to their email address lists for spam purposes.